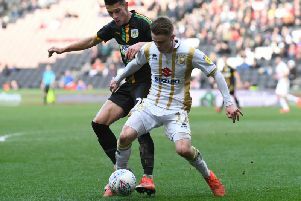 Goals have proven hard to come by for this weekend’s opponents Crawley Town but MK Dons cannot afford to get complacent, says manager Paul Tisdale. The Red Devils have scored just seven goals in 10 games in 2019, as they sit 18th in League 2 without a win in more than a month. Two wins over Newport County, sandwiching a triumph over Carlisle United, have seen Dons get their season back on track, and host the 18th placed Red Devils without a win in more than a month. After appearing to have turned a corner in recent weeks, Tisdale says just as they were not getting too down about their previous poor run of form, the players could not get too carried away with their turnaround. "Most of how we prepare for games is mindset," he said. "It's easy to talk about tactics and details, but the mindset is important. We've won three games on the bounce, but we have to be very careful not to take anything for granted. "We're in fourth position, but Crawley have gone to the three teams above us and come close to getting a result against all three. They've done well against those teams. That should be a warning to the players." Gabriele Cioffi’s men were thumped 4-0 in the reverse fixture, with two goals from Rhys Healey, added to by Chuks Aneke and Kieran Agard. Crawley drew 1-1 with bottom club Macclesfield on Saturday, which Cioffi, left, felt was a point well-earned. He told the Crawley Observer said: “That was a good point. We played well against a tough team. The stats down the years are close between Dons and Crawley. In seven meetings, Dons have won three times, Crawley twice and two draws. The visitors’ last win over Dons came in April 2014 when two first half strikes gave them a 2-0 win at Stadium MK.